When I left to have Ire,I left Kunmi with his daddy and his nannies , considering the fact that the hubby is always busy I think its safe to say I technically left him with his nannies and that probably doesn’t make me mother of the year but what was I really supposed to do. Back then, just like any 2 year old Kunmi had his moments and in those crazy moments , I guess his nannies figured the easiest way to deal with his crazy is to pop him in front of the TV and viola the noise stops and he is completely immersed in the world of Dora the Explorer and Paw Patrol. You are probably thinking ooo but thats not bad well it was. He was watching TV basically every single minute he stayed awake and obviously this made him more crazy. He became so hyper , he will talk like Dora with a mixture of English and Spanish and he was distracted all the time. Maybe because he was dreaming of what his babe Dora and Diego were up to. So when I got home and I got an earful from his teachers. I went crazy mummy and tried to create stability in the boys life. How did I do this ? Simple! NO TV! on school days at least (before you crown me the world’s wickedest mum) so now he knows he is only allowed to watch TV two days a week and if he is on holiday 3 hours a day and it has worked wonders. He is less hyper and more in tune with his environment. 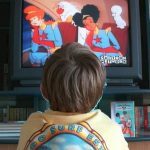 How much TV do your kids watch? Comment below. 1 Comment on How much TV is too much? thank you for this! currenty going through the same issue and will need to fix it soon. thanks again! !